Fresh off an astounding mid-season premiere featuring Saw Gerrera’s first appearance on the show, Rebels opted to stay a little closer to home in “Warhead.” Written by Gary Whitta, who did the initial treatment for Rogue One and who additionally penned the earlier Season Three episodes “The Antilles Extraction” and “The Wynkahthu Job,” “Warhead” does not advance any of the significant storylines of the season, but it emerges as Whitta’s best episode to date. 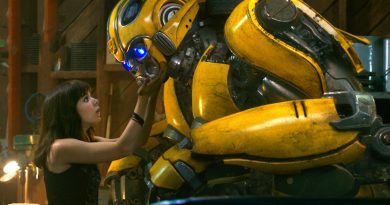 Whitta accomplished this through a little borrowing from alien suspense films, Alien and Predator, and pairing together Zeb and the Alan Rickman-ish AP-5. Zeb was chosen by Whitta to be one of the main characters in “The Wynkahthu Job,” but in that endeavor the character was sidelined by the focus of the episode being more about Ezra coming to understand the rakish quality of the pirate Hondo Ohnaka conceals a much darker personality. “Warhead” doesn’t quite explore much new about all things Zeb, but paints the “muscle” of the Ghost as someone who would belong to the royal guard of his people. It does so by removing the rest of his crewmates from the picture and leaving Zeb at Chopper Base in charge of security. Surprisingly, the dour AP-5 also receives some attention when thrown into a crisis with the Lasat. The pair are brought together when Zeb discovers and brings back to base an Imperial infiltrator droid, which nominally looks like a protocol droid in the fashion initially imagined by Star Wars icon Ralph McQuarrie. 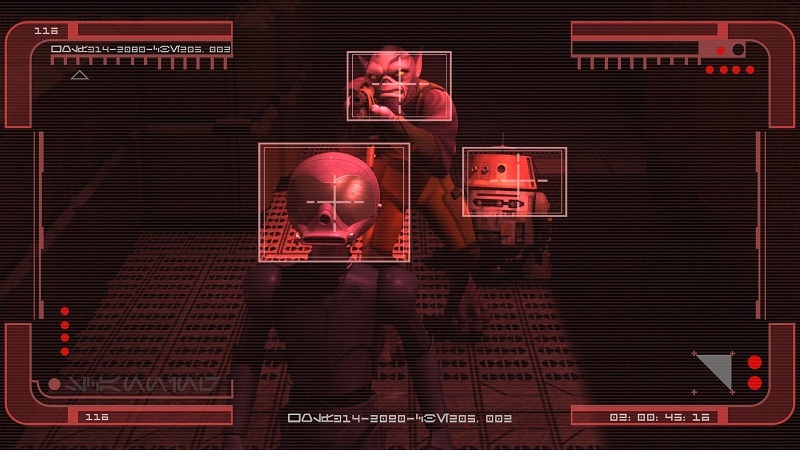 Perhaps as an ode to C-3PO’s final design, the droid receives a bump to the head when it encounters the spider-like residents of the rebel base’s planet and suffers from the droid version of amnesia. 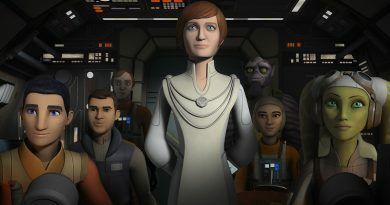 For a brief moment, it looks like the rebels have acquired a new inventory droid to assist AP-5 in the onerous task of cataloging rebel armaments and supplies. Then the new droid remembers. In a heartbeat, the droid transforms from passive protocol droid to threatening infiltrator droid with an appearance that echoes K-2SO’s long armed and long legged design. Inserted into this robotic mess is a warning by Agent Kallus as Fulcrum of the capabilities of the infiltrator droids. The use of Kallus in this episode is a nice touch to show Kallus’ dedication to his new allegiance, as well remind us of the important role Fulcrum plays for the rebels. While the ode to Alien falls more into the hidden danger aspect of the droid waiting to wake up – information the viewer possesses, but not the rebels – once the infiltrator droid goes active it also goes full on Predator, disappearing into the rebels’ stores with only its “blood” (oil) giving Zeb the ability to track it. Then, once the droid is subdued in an impressive feat of Lasat versus droid, it activates a self-destruct device with a countdown timer. 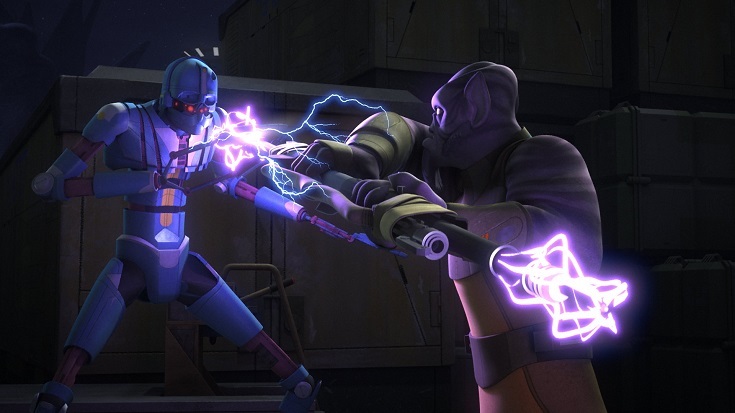 This gives Zeb the opportunity to show himself capable of responding to a threat to Chopper Base by stopping the droid. It’s also at this moment that AP-5 is provided some unexpected character development. It turns out that AP-5, introduced as an arrogant know-it-all, is not 100% comfortable of his own abilities when Zeb orders him to manipulate the droid’s memory banks and set the threat to detonate upon return to an Imperial base. Droids suffer their own personal quirks, fears, and characteristics due to the nature of their self-awareness and programming. K-2SO displayed as much with his inability to hold back his opinion, something Diego Luna’s Cassian Andor attributes to his reprogramming. Chopper can be both wildly bold in battle, but also fearful at times as well. So it’s nice to see that AP-5 follows this trend in “Warhead” by being more than a Star Wars Severus Snape droid with a personality that encapsulates apprehension of doing something new or potentially difficult. Even better, he overcomes it to save the day. 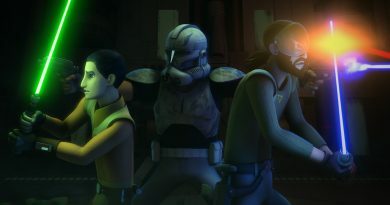 “Warhead” does not directly tie into either the Thrawn, Mandalorian, or Maul storylines, but neither do all Rebels episodes. This is fine because sometimes the best Rebel stories take the opportunity, when free of the restrictions of said storylines, to focus more on their characters in ways that might otherwise be unavailable. Season Two’s “Honorable Ones” is an excellent example of such an episode. “Warhead,” likewise, is more than just “filler” content between such episodes because it does what the best non-storyline episodes do: find a way to inform a larger storyline without being about the larger storyline. “Warhead” is about Zeb and AP-5 on Chopper Base, but it concludes with an appearance by Thrawn, who uses the failure of the infiltrator droid to find the rebel base to deduce that it must exist in a much smaller corner of the universe. As a result, “Warhead” offers a small adventure told with good pacing, direction, and story work that benefits often overlooked characters while offering a nugget of something larger. If the rest of the “filler” episodes follow this suit, they’ll be warmly welcomed. 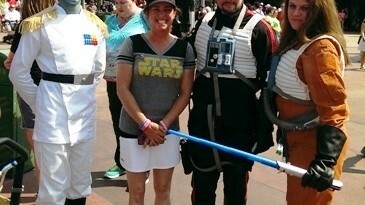 For more about “Warhead,” check out the episode guide on StarWar.com.